This week’s French Fridays with Dorie recipe, M. Jacques Armagnac Chicken (recipe published here in the New York Times), became Cognac Chicken in my household, simply because that’s what we had in our liquor cabinet. This is my second of Dorie’s roast chicken recipes and I have to say that the lady knows her chicken! This was possibly the juiciest chicken to have ever emerged from my oven. 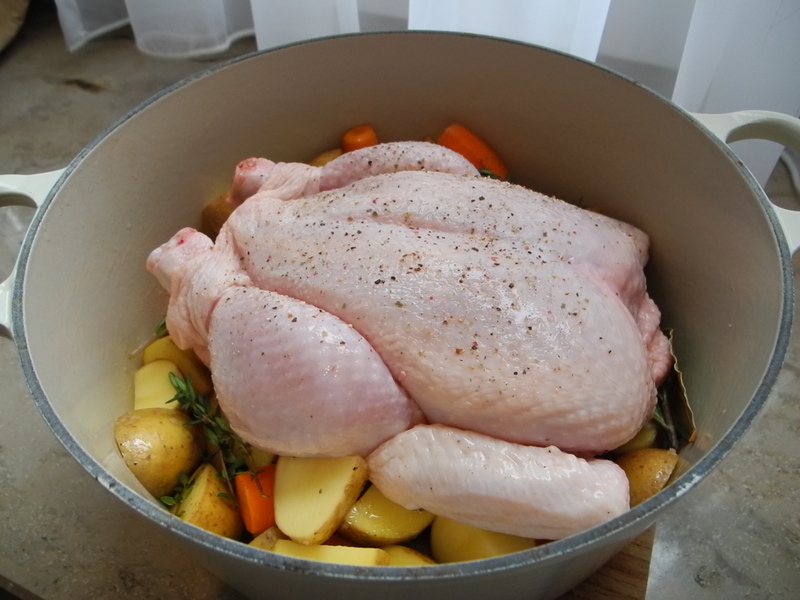 Both her Lazy Chicken and her Cognac Chicken recipes call for the bird to be roasted with some root veggies in a dutch oven instead of a roasting pan, but this time she also throws in some cognac and covers the pot during roasting. And as unsensational as that may sound, Dorie’s method has been a revelation for me. 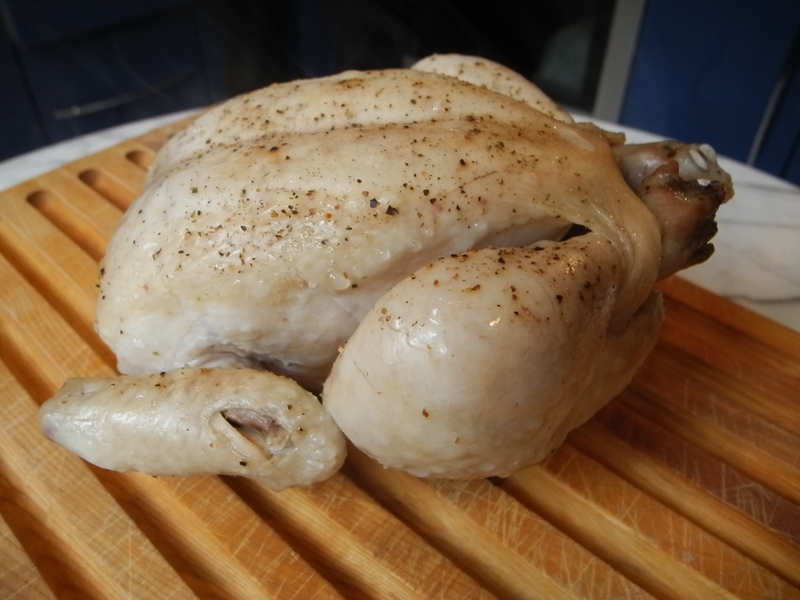 I have always roasted chicken in a roasting pan, which allowed for much nicer skin, but which did not produce such juicy meat. And the cognac surprised me as well by not overpowering the other flavors. In the end it gave a light aroma to both the chicken and the delicious sauce, but it was not a dominant presence. My only confusion with this recipe is that Dorie tells us that it should come out nice and brown. But how is that possible? 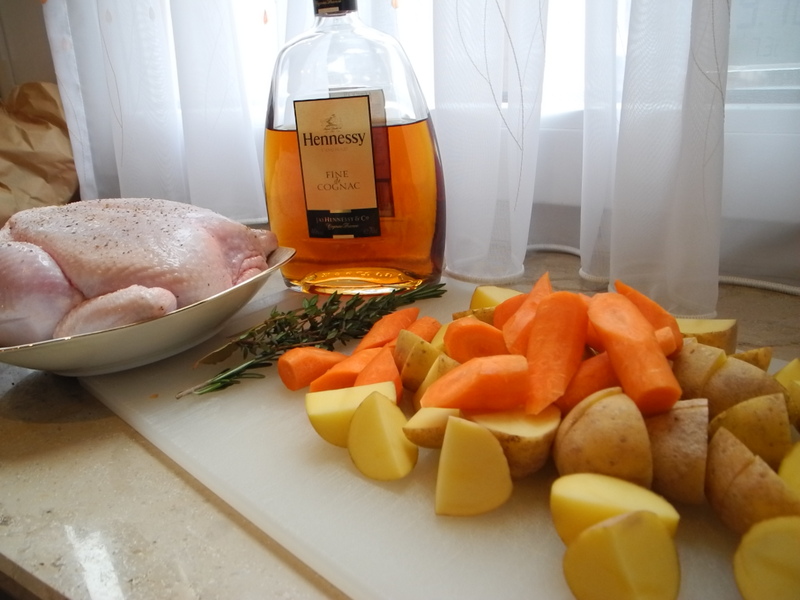 If the top is on and there’s cognac steaming away in the pot, how does the chicken brown? Next time I make this recipe (and there WILL be a next time) I may try to take the top off for the last few minutes of roasting, or maybe even crank up the broiler at the end in order to crisp the skin a bit. But regardless, this chicken was delicious. I served it with roast veggies and polenta. My husband proclaimed it to be the best chicken I’ve ever made. Thanks for a great recipe Dorie! No, there is no way it can come out nice and brown with thhe lid on. We took ours off and broiled it for a few minutes at the end. Made for a browner bird but still not as cripsy as I like my skin. This was ok but I live in a household where Neil cooks a fab roast chicken at least a couple of times a month and he is a true master. If I did not have him as my chicken expert, this would be a great backup. It does make for a juicy bird – I just wish there had been more flavour in the meat. I am glad you guys liked this – love the polenta idea – I always forget about polenta for some reason!! I LOVE polenta and my husband seems to tolerate it for my sake, or possibly simply because I am the one who does most of the cooking. This recipe seemed just made for polenta because the chicken needs one hour and so does the polenta. Perfect timing! I’m glad I wasn’t the only one with a pale bird!!! But it was still moist and delish! Beautiful plate of food, love the polenta with it! Great idea to take the lid off for a while to brown the chicken, after I took the lid off my chicken and saw the color I did leave it in the oven for awhile longer with the lid off to try and give it a tad more color. But, I never eat the chicken skin so I wasn’t too freaked out by the lack of crispiness and color. We like this one and will make it again! Yep, next time I’ll remove the top and turn the broiler on for the last 5 minutes. Hopefully it helps. Baking the chicken in the Dutch-oven method was definitely a great lesson for this week. I will be making this one again. 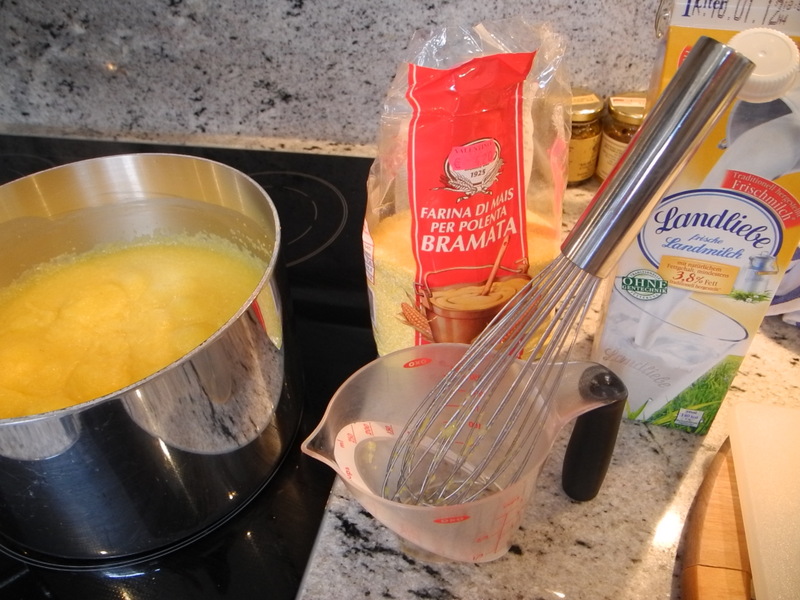 The polenta looks so creamy and delicious – I wish DH were a fan! I can’t say that my husband is a huge fan of polenta, but since I do most of the cooking he has learned to live with it. I tend to make it quite often when the weather outside is cold. Your plate looks mouth-watering. Great polenta side! Agreed, I would like to taste armagnac at some point, just to see what it is like. Ideally it would be interesting to make two chickens side by side, one with armagnac and one with cognac, just to really taste the difference. But since I don’t see that happening anytime soon, I’ll just be happy that this chicken is so darn tasty with cognac. We did ours with brandy, and thought it had great flavor. But we definitely wished it had been browner/crisper…but how? Love the polenta side. It’s funny that none of us would even mention the skin, if Dorie didn’t so specifically say it should be golden. Who cares about skin when you have juicy meat like this, though? Yum. You’re right–the lady knows her chicken. I also used cognac and mine tasted wonderful! Your dish does look delicious and in the end it’s the taste that matters! Your dinner plate looks yummy!! Happy friday! I’m so jealous of the all the natural light in your kitchen! 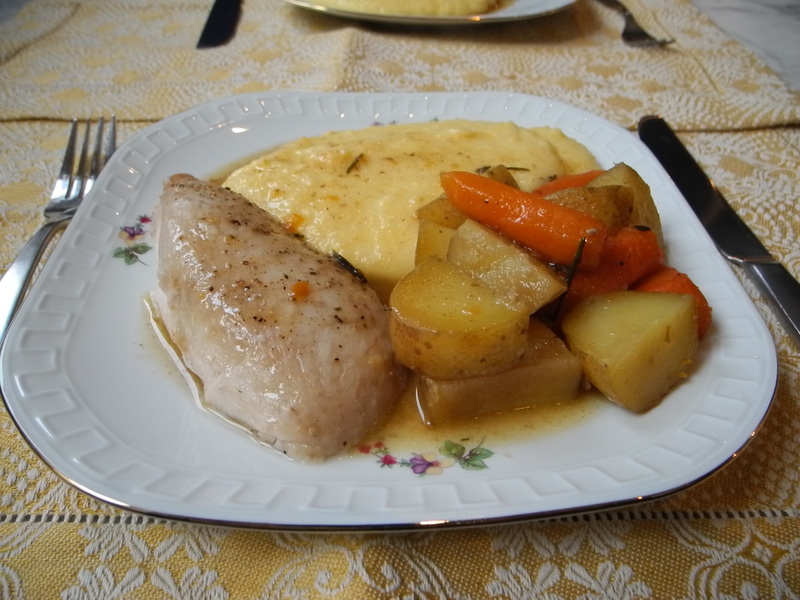 Your chicken looks great and I love it with the polenta – something else to sop up the delicious sauce. Thanks! This time of year, when it is dark outside by 4:30, I am working for all the natural light I can get. Taking pictures for FFwD seemed to be a heck of a lot easier in the summer. Mine turned out brown to my surprised ! I just splash the brandy over the chicken and cover with a piece of aluminium foil and that’s it. When it opened the foil, to my surprised the skin was evenly browned…haha just my luck , I guess 🙂 Yours looks good too…most important it tasted good 🙂 yes? A keeper for sure. We will absolutely make this again – I agree, it could have used some color, but the flavors were incredible. Yep, I looked at my bird and it did not have that “done” look, so it went back into the oven for a longer roast. But, with the lid, it never got that color and texture we all love. But it was good. I did leave a 2nd chicken in the oven even longer and it did get more brown…but a better idea would be, like you suggest, to remove the lid and let it roast uncovered for a bit. This chicken was juicy and flavorful, but I like my chicken to look cooked. Mine didn’t look done at all when it came out, but I stuck a thermometer in it and the thermometer told me that it was actually more than done. I guess in the end I would rather have juicy chicken than crispy chicken. I just loved how easy this meal was. It’s perfect for a hectic day. Everything got ready while the kids were doing their school work. I’ll definitely be making this again! You know I had that same thought about how it was going to be brown with the lid on. I decided to add butter under the skin at the last minute, which I think helped with the color. Joel Robuchon’s method has you roast uncovered, turing the bird on different sides approximatley every 20 minutes and the color is beautiful. Having said that, this recipe doesn’t require much effort and is great for lazy days. Really enjoyed your commentary and photos! Thanks! I’ve done the recipes which require regular turning, but now having done Dorie’s recipe, I think I’d rather have juicy meat than a pretty looking bird. And since Dorie’s recipes are also a heck of a lot lazier, I will definitely be sticking with her method going forward… with maybe a little broiler action at the end. flavor was fantastic. Pairing it with polenta is a wonderful idea. I agree with all, that taking the lid off towards the end would be good. Happy weekend. Yeah, I was just as puzzled by you at Dorie’s comment that this would be brown – it just wasn’t. But it tasted good, and yours looks fab. I used Calvados (well, it’s cognac too), because for some reason I have two open bottles of it–that tasted good too. Calvados is apple brandy right? I bet that would taste great with this chicken. You hit the nail on the head with your description of light aroma but not dominant presence. I too was puzzled by the pale chicken and decided to have some fun with blowtorch. The polenta looks so creamy! I made brandy chicken. I loved this technique. It couldn’t be any easier. I’ll be making this again too. And gathering ideas for how to brown the skin. Mine was pale too, but that seems to be the trend. Yeah, I don’t see how the chicken was going to be ‘golden’. Still we loved it and I’ll be making this again and again. Maybe I’ll even get Armagnac sometime! Yes, one of these days I would like to give armagnac a try as well. I really wish that it was easier to buy all these brands in smaller quantities. I just don’t drink brandy often enough to justify having several large bottles of it in different flavors in my house. My chicken was pale too. A good method for moist chicken, but definitely needs some time without the lid to brown a bit. You are so right about why I was thrown- Dorie’s comment about taking off the lid (carefully she wisely advised) to see the “browned bird”. Had I not been rushing up to that point I would have thought harder about how this could not have been possible….but I think this disappointment added to me overall reaction. And since someone wisely reminded me that Costco has affordable organic chickens, I may give it another shot. So interesting that you only get smaller birds over there- would not have thought that ! Your chicken looks so delicious! And I agree that the method produced one of the juciest chickens ever! We totally got past the brown skin with that. I did actually use the Armagnac. It was nice, and there’s a very subtle difference in flavor – but not sure that it’s worth the expense. That said, next time I might add the prunes (just didn’t have any on hand) to enhance the flavor. But all in all – a hit!! Made mine with Armagnac. The liquor itself doesn’t taste like prunes to me. The prunes were a great addition though. The sauce was wonderful but whether using Armagnac as opposed to any other brandy made a difference I couldn’t say. Thought next time I might try Slivovitz which brandy made with damson plums. Interesting, I LOVE damson plums, but I’ve never heard of Slivovitz. Will definitely try it if I ever see it. Love that your hubby loved it too! Never would have thought of polenta as a side! Your dinner looks great! I’m basically addicted to the sauce! I let it roast with the top off for the last bit, to brown the skin. It would be nice to try this with Armagnac and prunes someday, when my budget allows, but Cognac was wonderful with this. I agree with tsimmisthyme, Slivovitz would work well with this, too. We have some friends that are in an Eastern European-influenced band and when they got married, we did the toast with Slivovitz. it’s quite good.